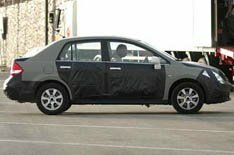 This is the replacement for the Nissan Almera, spied testing in Southern Spain. 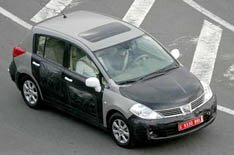 The car has already been released in Japan and the United States, but Nissan has yet to confirm when it will be coming to Europe. However, these images also show a saloon version of the car, which has yet to be released anywhere. In the USA, the Almera (known as Versa) uses a 1.8-litre 16-valve engine, producing 122bhp and 127lb ft of torque at 4800rpm. It comes with either a six-speed manual transmission or a four-speed automatic.Lotus has been linked to the European-spec model ever since one was spied at Hethel recently. But the tiny market for small saloons in Europe means that the booted version is likely to be US- and Japan-only. Earlier prototype were testing in England and Germany with very minimal disguise so why heavly disguise it now?